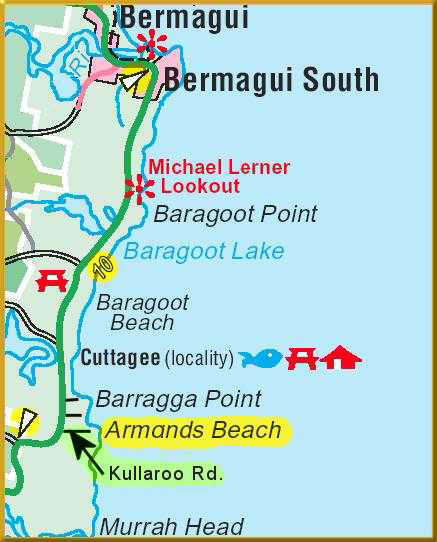 Travelling south from Bermagui, follow the Tathra - Bermagui coast road for approximately 8 km, to the one lane Cuttagee Lake bridge. A further 2 km south of the bridge turn left into Kullaroo Road. In half a kilometre the road ends. There is the - "Armands Bay Beach" sign - as shown on the home page (please note that this sign was replaced by a newer sign and which has since been stolen!). 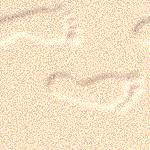 There is a 5 minute walk to the beach.The beach is set in natural bushland. There are no toilets or facilities at the beach. Take everything you need with you.